Mountain Camp Woodside, formerly “Camp Unique,” was founded in 1976 by Bob Cavalli, the Athletic Director for the Town School for Boys in San Francisco. 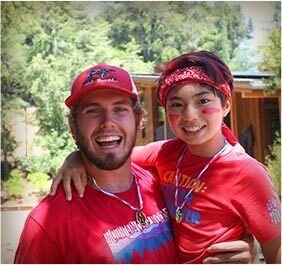 Since 1993, the camp has operated on the beautiful 63-acre campus of the Woodside Priory School in Portola Valley, CA, near Palo Alto. In 2006, Camp Unique partnered with Mountain Camp, a resident camp with a location in Lake Tahoe, to jointly run the camp. In 2010, Mountain Camp fully took over Bob’s interest in the camp and changed the name to “Mountain Camp Woodside” both to bring it fully into the Mountain Camp family and to reflect the long-standing relationship with the Woodside Priory School. Both Mountain Camp and Mountain Camp Woodside have been accredited by the American Camp Association(ACA) and are active members of the Western Association of Independent Camps (WAIC). The caring counselors are an integral part of a camper's satisfaction of the camp experience. - Michelle A. © Copyright Mountain Camp Woodside. All Rights Reserved. © Copyright 2019 Mountain Camp Woodside. All Rights Reserved.